Even though this picture was probably taken around Easter time, it also makes me think of summertime's pending arrival and the Memorial Day visits that officially hinted at our three months of vacation. I say "hinted" because when I was in school, the year usually ended just a day or two after Memorial Day, making up either for snow days or a later start to the year. In this photo, I'm probably in first grade and my sister is in kindergarten, and the babies are my now-grown cousins. We're all gathered around my Grandma Churchill whose farm near Mansfield, Missouri, we loved visiting over the summer. Leading up to Memorial Day, my mom and my Aunt Diana would plan their plastic flower hunt and hit the TG&Y, Ben Franklin and Mini Mart to find the best buy on forever-blooming roses, daisies and daffodils. And then we'd load up the car with all of our plucked plastic and take them to Grandma's house for a weekend where we'd decorate the graves of long-gone relatives and family friends. Many of the graveyards we visited were practically hidden from view. Some, we'd drive up a gravel road as close as we could, but then walk the rest of the way up a hill along a winding, brier marked path, toting our plastic wreathes and sprays with us in plastic shopping bags. Once we reached our destination, we'd clean the graves and re-distribute old flowers that still had color left in them to sites that seemed lonely and forgotten. I loved hearing the old stories of people I'd never met, and walking over the moist grass to visit people whose names I'd never heard. Grandma Churchill knew everybody, and everybody knew her, whether she was grocery shopping at Town & Country or visiting a neighboring church's revival. Why, she even treated complete strangers as if they were long-lost pals. I remember hearing a story once of how Grandma thought she spotted a friend in a store and walked up behind the woman and pinched her on the arm! But when the pinching victim turned around, Grandma realized that she'd never seen the woman before. I don't know exactly what ensued, but I do know that when she retold the story, she could hardly tell the tale without bursting out chuckling half-way through it! And when Grandma got tickled, the laughing was contagious. On this Memorial Day, I wish you many warm memories filled with comfort and cheer. Did you ever have a day when a certain theme or motif popped up so many times that you felt someone was trying to tell you something? A few weeks ago, I had been missing my annual trip to France, yet it seemed like everybody I know was talking about something French. A friend was traveling to Paris, and I offered her her tips on off-the-beaten-path destinations. I also happened to be on a major '80s French pop kick where all I wanted to listen to were the old hits I remember from my days as a university student in Bordeaux. And I had just finished reading The Private World of Yves Saint Laurent and Pierre Bergé, the monumental tome packed with images from the duo's grand residences. So clearly, France was heavily on my mind, and I was feeling a little blue that I couldn't be there. It was just lying there, face up, as if someone had placed it right there on the sidewalk for me. I picked up my little discovery, looked around to see if anybody was watching and then stuck it in my bag. 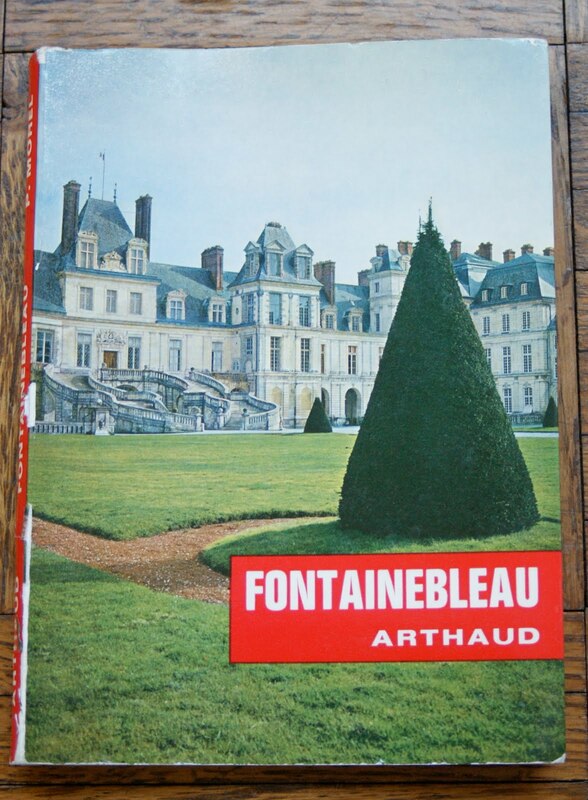 Once I got home, I started flipping through the pages featuring this royal estate outside of Paris that has harbored queens, kings and even a pope. There are several full-color pages of gorgeous rooms likethe salle du trône pictured here. 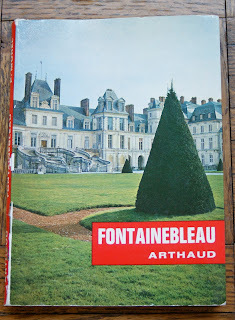 I went to the fabulous residence once while I was visiting Paris, but have never entered its doors, so I enjoyed the mini-tour I took while lounging on my sofa. Clearly, the surrounding grounds and forests are awe inspiring, but apparently, at least in 1967, it was also a destination for mountain climbers who have "discovered that the sandstone blocks of Fountainebleau offer difficulties comparable to the classic passages of the most famous climbs....Roped together, wearing rope-soled or hob-nailed shoes, they go there in groups and prepare their future exploits on a miniature scale." 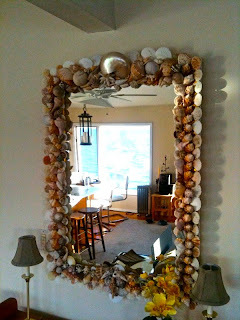 Fabulous & Frugal Fun: A Shell of a Mirror! Whenever I'm at the beach, I can hardly resist picking up seashells and marveling over the shapes and colors that magically appear in the sand. They say that Sanibel Island is the seashell capital of the world, so if you love these gorgeous treasures from the deep, then this is most certainly a destination, just as it was when Rick Miller visited the island a while back. He hit the jackpot in a shallow sand bar pool. 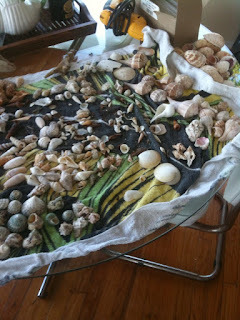 "I looked down and there were shells everywhere," he told me. "It was if the sea had deposited all the empty shells in one spot. I ran back and got a bag and just started pulling up these beauties as fast as I can." 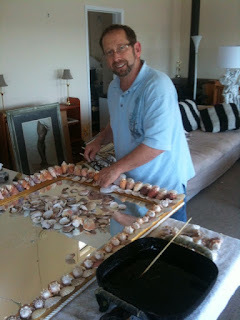 Three hours later, he had amassed so many shells that he had four huge boxes filled and ready to ship home. When it came to adding a decorative element to his Fire Island beach house, Rick found just the right opportunity to make use of all those shells. He carted them out along with his hot glue and got to glamorizing a plain, gold framed mirror. Then in a matter of hours, and careful placement, he rode his wave of creativity and patience to achieve this sensational, seashell mirror. Thanks to Carl & Co.'s Mark Ciolli for sharing his photos with me. We talk about putting a little spring into your step, but why not add a little extra bounce to one of your walls? 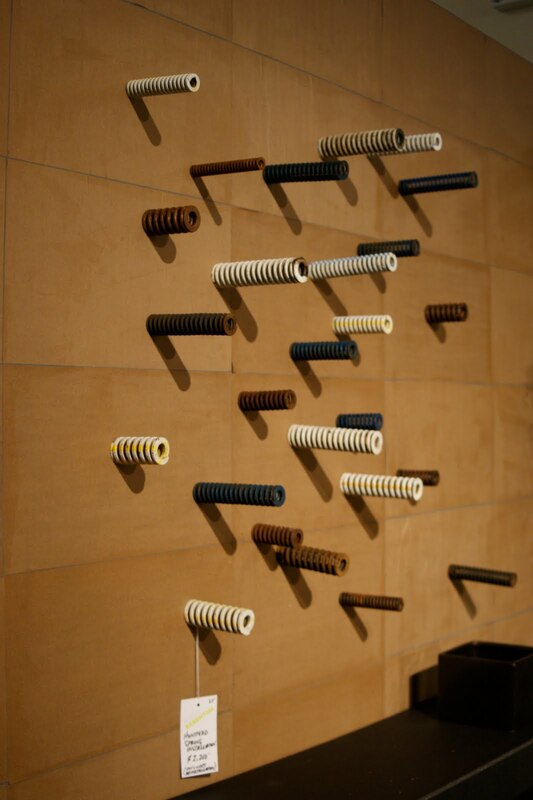 That's what designer James "Ford" Huniford did with a bunch of old hardware springs at this month's Housing Works annual benefit, Design on a Dime. Ford took different shapes and lengths of springs, colored them with coordinating paint and applied them to a wall for an unexpected, artistic installation. I'd call that flexible design, wouldn't you? 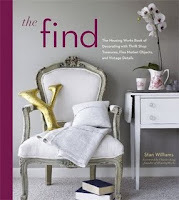 During the life of The Find: The Housing Works Book of Decorating With Thrift Shop Treasures, Flea Market Objects and Vintage Details, I've met so many talented, creative and giving people that when I step away from the experience and really think about it, I am thoroughly awed. The book came out a little more than a year ago, and the blog only a couple of months before, so to come this far and see how many people have joined me in the past year in my quest for fabulous and frugal living, I am honored. And thankful. Just the other day I was blown away by one of my earliest acquaintances in Blog Land, LeAnn Stephenson, The Vintage Laundress who included me in her "Thingy Thursday" posting. Well I'd be overly modest if I just said "included," because the whole darned thing is about me and how I like to collect Dolly Parton memorabilia. The moment I met LeAnn, I felt like I'd known her forever. She has the kind of amazing personality that you wish you had in a next-door neighbor, and any time I am able to spend with her, even if it's just a brief chat on the phone, I immediately feel happier and inspired. If you want to read more about me and my Dolly fascination, head over to The Vintage Laundress and read about it here. LeAnn is not alone in the support I've received for my thrifty pursuits, and I continue to be amazed by the power of social media and the strength of good-old, word-of-mouth marketing. I sincerely thank you all. Even though I'm lucky to be able to work pretty much on my own schedule, there's something about Mondays that leaves a slight pang of dread, even when there's absolutely nothing dreadful looming on the horizon! That's why I'm sharing with you this cheerful Pascall candy tin I bought at a stoop sale in Brooklyn a few weekends ago. The merry mix of masqueraders that encircles this $1 discovery is expressive and colorful. 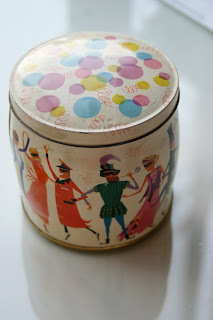 Then when you flip the tin over, you see that it once held one pound of White Heather chocolates and toffees. Now how could that not brighten your day? Anytime a package arrives from my good pal Ruth Handel, you can bet it's going to contain a surprise that I will absolutely adore. Well this little arrival just takes the cake! Ruth knows that I'm an amateur baker, so when I'm not making pineapple upside-down cakes or tunnel of fudge bundts, I like to whip up a layer cake covered in rich butter cream. What better way to make that confection all the more lovely than with this Ateco Decorating Comb, which I think dates back to the late 1950s or early 1960s, based on its 55-cent price tag from a little shop called Williams Sonoma. I like how the packaging touts "simple quick decorating of pastries and cakes," that will "give your cake that 'finished' look!!!" I think it's funny how "finished" is in quotation marks. Is it not really finished? Or just sort-of finished? Is it a euphemism for something that I can't figure out? Who knows! And I love how excited they are to make this announcement on the packaging -- so much so they had to use three exclamation points. I think I would be, too!!! The other day at Housing Works' benefit Design on a Dime, I was struck by this novel idea for making bunkbeds, created by Cannon for Sears/Kmart, the sponsor of the event. 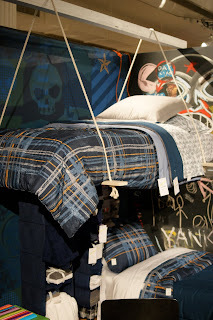 Now I can't tell you how sturdy this twin-sized bed hanging from the rafters might be, but I know that if I were a kid, I'd love hanging from the ceiling, and quite possibly turning it into a swing if Mom wasn't looking! Cin-cin to fashioning a shimmering chandelier out of a bunch of mismatched glasses of varied shapes and sizes! At New York's tableware destination Fishs Eddy, they've taken goblets, wine glasses, flutes,martini glasses and more, strung them on fishing wire around a light source, and turned their display windows into a whimsical, hanging bar. One of the most popular features in The Find: The Housing Works Book of Decorating With Thrift Shop Treasures, Flea Market Objects, and Vintage Details is a little sidebar about how to create a thrift shopping kit. Since you never know when you're going to come upon a driveway loaded with goodies or spy a thrift store teeming with wonders, it's good to have your kit ready for that moment the thrifting bug bites! • A good tape measure that measures at least 8 to 10 feet. • A small digital camera that is easy to use. If you' re unsure of purchasing an item, you can document for further consideration. However, be warned: Your discovery will most likely be gone if you wait too long to claim it. •Dry wipes, such as Swiffer, which are capable of discretely removing dirt and grime and potentially revealing a treasure that others have passed by. • A hand sanitizer. There's so much dusty and dirty stuff that you'll feel liberated to touch and investigate everything if you know that later you'll be able to wash your hands easily. • A design notebook that's filled with budgets, wish lists, room measurements, color chips, design inspiration and fabric swatches. You'll have easy reference when you're waffling between what you need to complete a design project and something that you simply just love! The Find: A Bowl Full of Goodness! I was looking around my apartment the other day and notieced that somewhat magically, without trying, I've gathered some of my favorite things inside one of my favorite things placed atop one of my favorite things! I picked up the Homer Laughlin bowl for 75 cents at Housing Works because it looked like the kind of dish that one would serve green beans in. 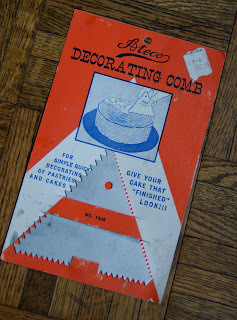 I have it placed atop a decoupaged platter from the fabulous John Derian. Inside the bowl, starting clockwise from center, is a pink, Citroën Deux Cheveaux Corgi car that my dad gave me when I was in first or second grade. Below it is a Monkees Corgi car that the proprietor of a thrift shop in Connecticut offered me last spring. Beside it is a package of round Las Vegas coasters my decorator friend Mark Ciolli gave me, reminding me of how when I was a fashion editor, I was in Sin City no fewer than four times a year! And I don't even gamble! Then there's a medley of cookie cutters that I bought at a yard sale for 75 cents, bringing back childhood memories of cutting out of sugar cookies that were lucky to come out of the oven unburned! You can hardly see it, but there is also the "S" from a miniature weather vane attached to a note from the amazing visual virtuosos Michael Quinn and Heather Kerr. You can see the top of Heather's head on the note peeking out above the cookie cutters. And finally, there are my beloved "Little Forks" that my dad found at an estate sale in my hometown of Independence, Missouri, and shipped them to me in New York. You could call this group of goodies a collection even though individually they have very little in common except that they all relate to me in some way. I like keeping all my treasures handy in this bowl, for who knows when I might need to serve an hors d'œuvre with a mini-fork or cut out some cookies at the last minute. But mostly, there right where they are so that I can rummage through them for a serving of creative inspiration or a dose of comforting memories. Sometimes the objects we find hold even more charm when they are imperfect, especially when we can see a way to bring them back to a better condition than the one in which we've discovered them. 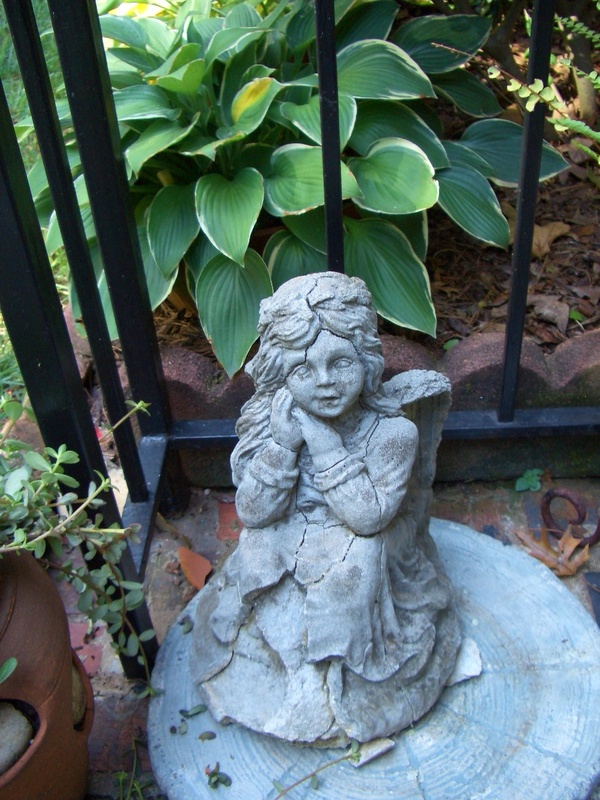 Judy McGowan in Decatur, Georgia, displayed such foresight when she was offered this "injured" angel at an estate sale. "Quite a few pieces of the concrete was broken away around her face, but I was able to fit a few of them back in place -- like repairing a piece of china," Judy told me. "Now she greets everyone at the entrance of my home." Do you have an amazing object that you've found that cost you absolutely nothing? If so, send me a photo and tell me your story at theelegantthrifter@gmail.com. 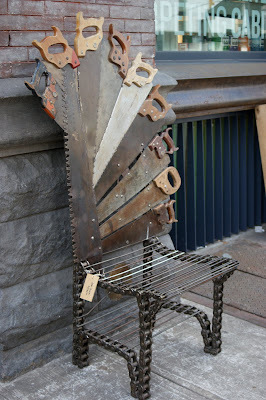 Do you have a bunch of old saws back in the shed that you can't quite figure out what to do with? Maybe your folk band simply has enough saws in its repertoire and all the old wood cutters are taking up too much space? Throw an industrial gear chain into the mix like they did at Green Depot on The Bowery in New York, and you've got a tough looking chair. Pretty sharp idea, huh? If you're looking for great ways to take small spaces and maximize their potential, check out Apartment Therapy's Big Book of Small, Cool Spaces by Maxwell Gillingham-Ryan. 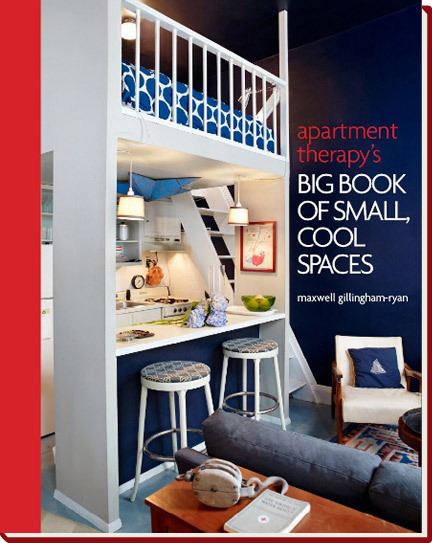 Published by the same talented crew at Clarkson Potter as The Find: The Housing Works Book of Decorating With Thrift Shop Treasures, Flea Market Objects, and Vintage Details, the Apartment Therapy book features almost 30 residences in New York and Los Angeles, and covers every room of a small living space. 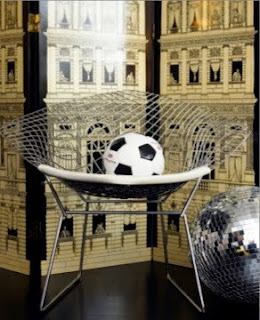 Gillingham-Ryan also features lots of uses for vintage and thrift that inspire and enlighten. 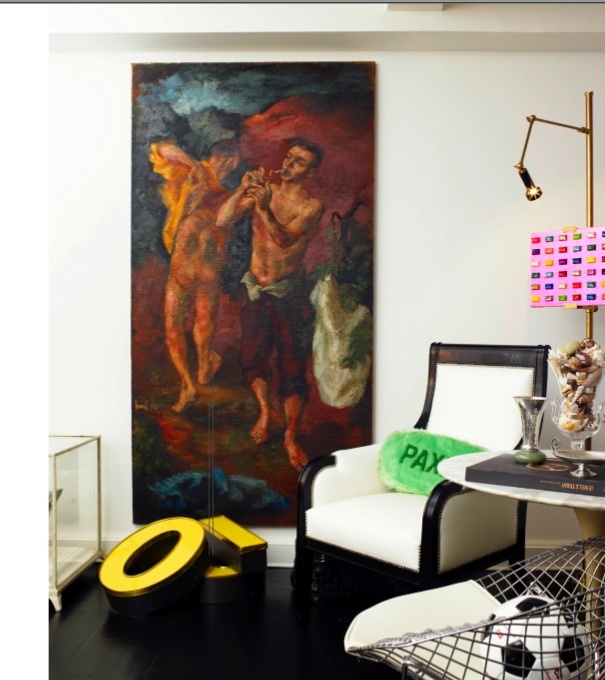 Visit Apartment Therapy for a wonderful preview. Isn't it amazing that no matter how hard we try, most of us simply have too much stuff? I'm not talking about the extreme of being a hoarder and packing a room to the ceiling with everything from used mattresses and plastic bags full of old clothes to boxes of magazines and every take-out container you've used over the past 10 years! But how many times have you asked yourself, "I don't need that chair because it's sitting on top of my kitchen table?" 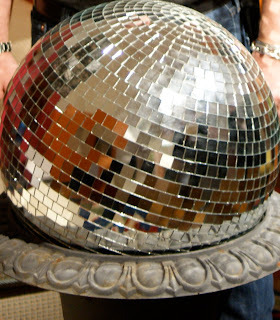 Or "Maybe I should pass along that mirrored disco ball that I have rolled under the bed?" If you're Randall Beale, half of the Beale-Lana design team, you've got so many fabulous things that you simply can't put them all in your clients' home fast enough. 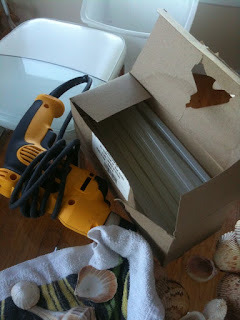 When Randall moved recently, he found himself overloaded with amazing treasures. So instead of selling them off he donated them to Housing Works to offer lucky shoppers who attended the organization's annual benefit, Design on a Dime. You might recognize some of the items for sale in the Beale-Lana booth from The Find: The Housing Works Book of Decorating With Thrift Shop Treasures, Flea market Objects, and Vintage Details, which were photographed by Jim Franco. 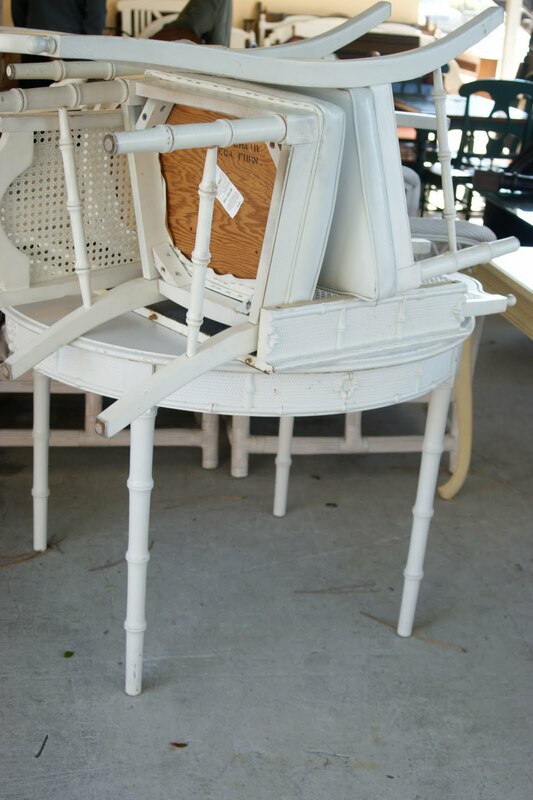 The black and white chair is a Beale-Lana original, and was waiting to be snatched up by a lucky shopper for almost one-tenth its original price. 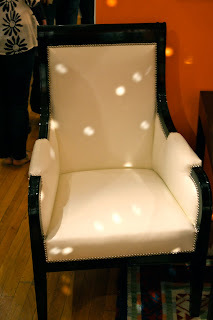 You may wonder why this chair is covered in white spots. Those aren't spots; they're simply reflections from a familiar disco ball across the way, of course! Last summer, I took a tour of Randall's home for LXTV's "Open House." And since he's moved and consolidated, I thought I'd share with you one last peak of his fabulous, East Side residence. Much to my delight (and Veli's displeasure), a dear friend handed me a box of matchbooks that once belonged to his mother. 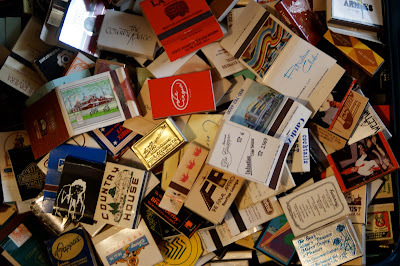 Since I'm not the one to refuse more than 25 years worth memories wrapped around some flame sticks, I happily accepted them and started making my way through what appears to be at least 1,000 books collected from every corner of the world, from Japan to former Yugoslavia, as well as from all over the United States. So many caught my eye, either because they represented a beloved establishment that no longer exists or came from a favorite locale. Some even made me recall childhood destinations, and then others did pretty much everything, oddly enough, like this Chi-Chi's box of matches. 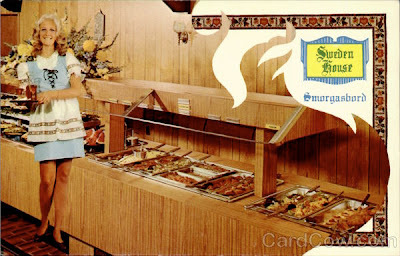 In the mid-1970s when Chi-Chi's went in near Kansas City's Blue Ridge Mall (recently leveled to make room for a Wal-Mart), it marked the beginning of the Mexican food craze in the U.S. Until then, our taste for Mexican had only been satisfied by Old El Paso kits to which my mom added hamburger, or by Taco Bell, which in those days, was inconveniently located clear across town. Chi-Chi's was somewhat more upscale, even though it was a chain. I know we didn't frequent it often, but I seem to recall a baked chimichanga that made quite a fiesta. 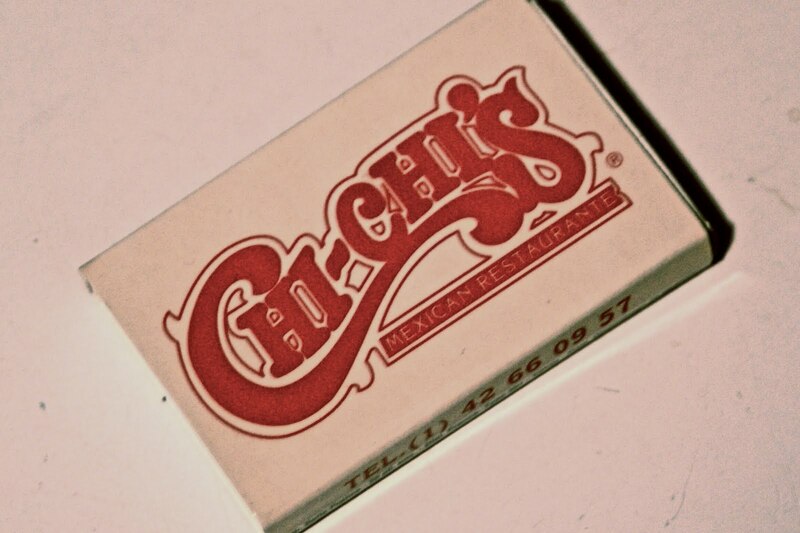 But what makes this box even more weirdly special is that it came from the French branch of the Chi-Chi's chain in Paris...yes Paris, France, not Texas! As a student in France in the mid-1980s, finding Mexican cuisine was a rarity, and if you did, you were likely to be served up a bland, crêpe-ish looking roll-up mocking a burrito or a flimsy taco shell filled with chopped tomatoes, rice and parsley! Oh, and forget about the margaritas that barely had any ice in them and whose flavor resembled a Sweet Tart! I remember going to one place that didn't realize that a margarita was made with tequila, and instead was serving them with vodka. Eeew! I was vigilant in trying to assimilate into French culture. I stayed away from other Americans at my university and pretty much only socialized with French people. I ate French, studied French, danced French (bouncing in the mirror all in a row to Indochine's Troisième Sexe!) spoke French, and tried as hard as I could to BE French. As well as I spoke, I never lost my American accent, and as hard as I tried to change my look, I always got called out by my bag or by my shoes. And as much as I adore une coupe de champagne and pâté de fois gras, a tasty margarita and a spicy taco always have, and still do, hit the spot! Happy Mother's Day to all of our mothers. Free is such a fabulous notion, especially when it's attached to a find that arrives unexpectedly unexpectedly and inspires creativity. 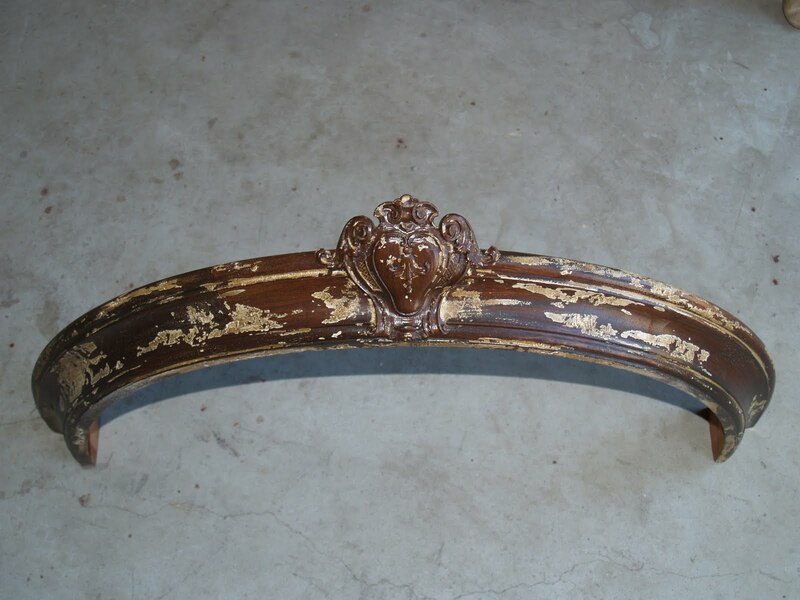 Tamra Cook who lives in Paso Robles, California, was absolutely surprised when she discovered this treasure: half of a round window frame. 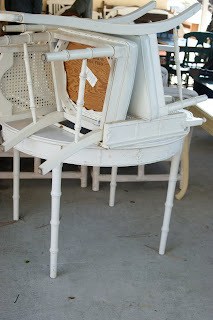 "My freebies are few and far between, " she told me, "usually something someone wants to unload from a garage sale that they are sure won't sell -- mostly bad recliners and particle board TV stands. Yuck!" On first impulse, she admits to having almost passed up the frame, but quickly changed her mind. Instead, she took it home, added the ornament and plaster, and then stained and antiqued it to make a crown to hang over her bathtub. Do you have an amazing free discovery that you'd like to share? If so, email a photo and your story to theelegantthrifter@gmail.com. Just what are you supposed to do with all those paint chips after your redecorating is complete? If you're Michael Quinn, the visual visionary whose ideas I've shared with you many times, you just might use them as thrifty note cards! The other day Michael dropped off a tin of cookies the other day thanking me for featuring his home tour on The Elegant Thrifter and attached this thank you note made of a paint sample card on which he typed out his friendly message. Charming, creative and colorful! With the arrival of warm weather, my appetite for a good garage sale has mushroomed. The problem is that here in New York City people don't have yards, let alone an empty garage to set up shop and unload their unwanted goods. So the next best thing is a stoop sale where people sell their wares on the front steps of their buildings. Imagine how my curiosity was piqued when I saw a sign in Brooklyn advertising a "gate" sale that promised all kinds of vintage goodies -- so much so that I got up the next morning and hopped a Brooklyn-bound train to follow the signs I'd spied the previous evening. It took a little hunting, but we found it, and here's the take, all for $6! You saw the tray from Sweden House on Monday, but that wasn't even half of my discovery. There was a mysterious Cuban doll; a set of four, plastic framed ballet prints from Woolworth, still with their four-cent price tag on the back; two Baccardi swizzle sticks also from Cuba; a cheery candy tin; and finally a demonic looking cross stitched dancer in a golden frame. May I repeat? $6! Relish these delights, if you will, and take a peek at the little video I made of my trying to find this elusive sale and the ah-ha moment of discovery! 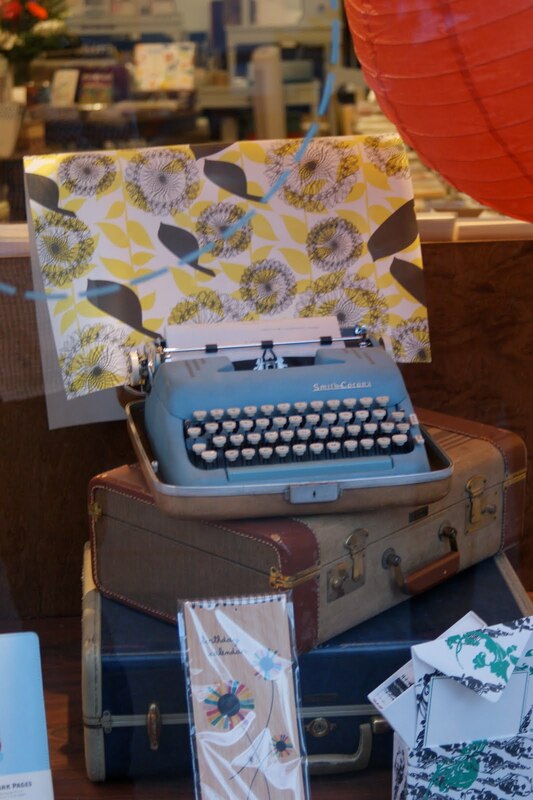 This blue Smith Corona typewriter in the window of Papél, a stationery shop in Cobble Hill, Brooklyn, reminded me of the green one I used to use when I was a journalism student at the University of Missouri -- Columbia. I wasn't the first one to use it, since it had also belonged to my dad, who used it when he was in college. 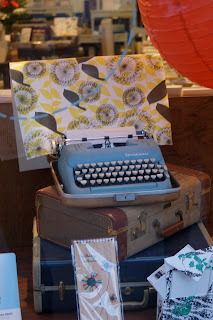 I typed out so many term papers and writing assignments on that typewriter while sitting at the vintage desk I talked about in The Find: The Housing Works Book of Decorating With Thrift Shop Treasures, Flea Market Objects and Vintage Details. 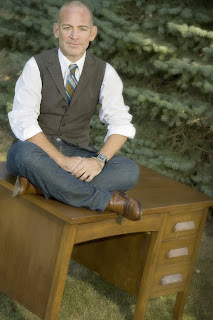 I don't know if my dad still has that old typewriter, but my sister now has the old wooden desk in her home office. 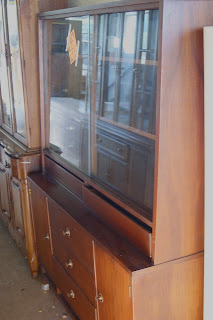 As I recounted in The Find, I bought that hulking piece of furniture at a thrift store in Independence, Missouri when I was 19 and hauled it home in a 1977 four-door, powder blue Chevy Chevette for my dad to lovingly refinish. You can tell it's an exceptionally sturdy piece of furniture since I was able to sit right on top of it for the author photo that Bob Greenspan snapped for The Find. When I was in elementary school, I remember a smorgasbord buffet that we occasioned as a special treat. I don't know if it was more of a treat for my mom, who prepared nearly every meal we ever ate, or for us being allowed to pick what we wanted from steam tables heaped with fried chicken, spaghetti and meatballs, sliced ham and all the trimmings. Either way, it was a special occasion, and we left stuffed to the gills. The restaurant was dangerous for a kid like me who liked to eat, because temptation was only a fork or a spoon away. Before you slid your melamine tray along the counter to collect your entrées and the side dishes of spinach, mashed potatoes and macaroni and cheese, right there, laid out right at the beginning of the line were the mouth-watering desserts: huge slices of gooey cherry pie, seven-inch tall portions of coconut cream pie, gigantic wedges of German chocolate cake and enormous parfait cups heaped with butterscotch pudding, finished off with a frilly squirt of whipped cream. It was a kid's fantasy -- dessert before the meal! The caption on the reverse of the card makes me hungry right now with it's delicious description: "Every day -- Hot dishes -- Cool sparkling salads -- World's fines smorgasbord service. Finest food and gracious dining without extravagance."